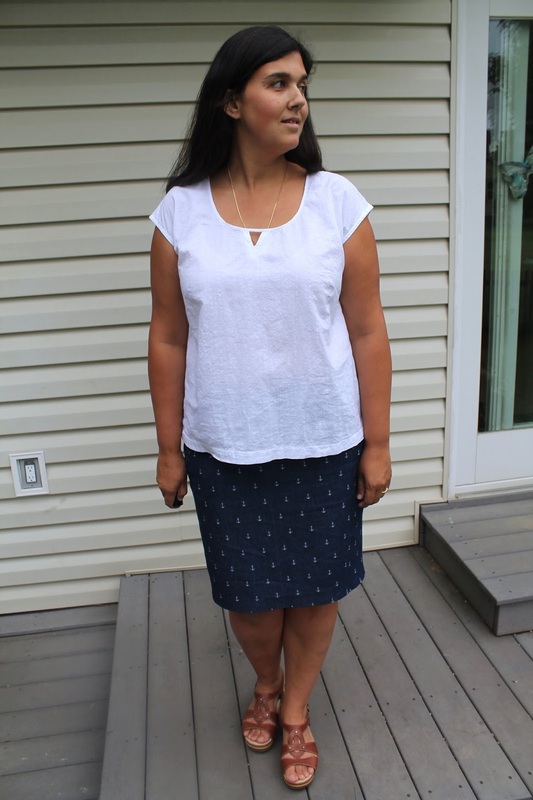 I've really been enjoying sewing up more versions of Simplicity 1377. After I finished my last two, I sewed up three more, using three cuts from the deep stash in the process. 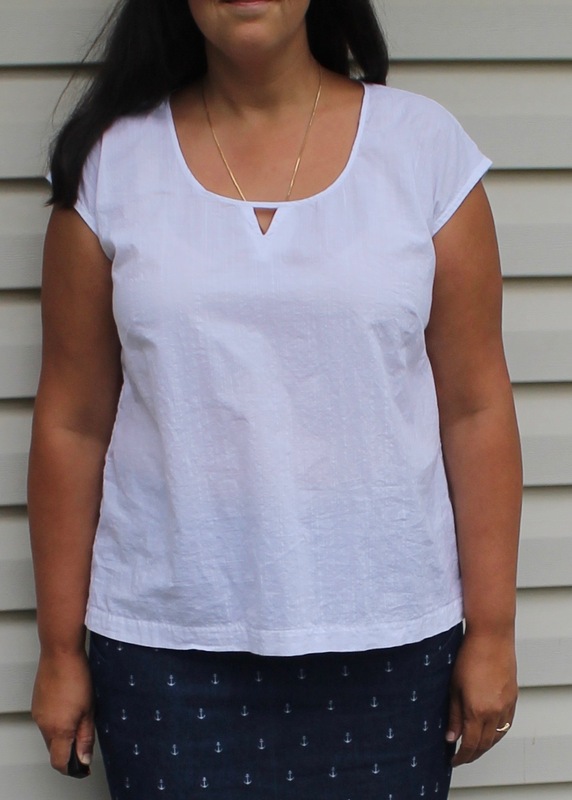 This one is made of a long-stashed white cotton crosshatch shirting. I added a v-shaped cut out and made a thin bound neckline. I French-seamed the shoulders and side seams. I adore this blouse, despite the fact that I made the cut-out facing too small and was forced to stitch it down to keep it in place. It fills a real wardrobe gap for me, providing a pairing with several bottoms that didn't have any good mates. 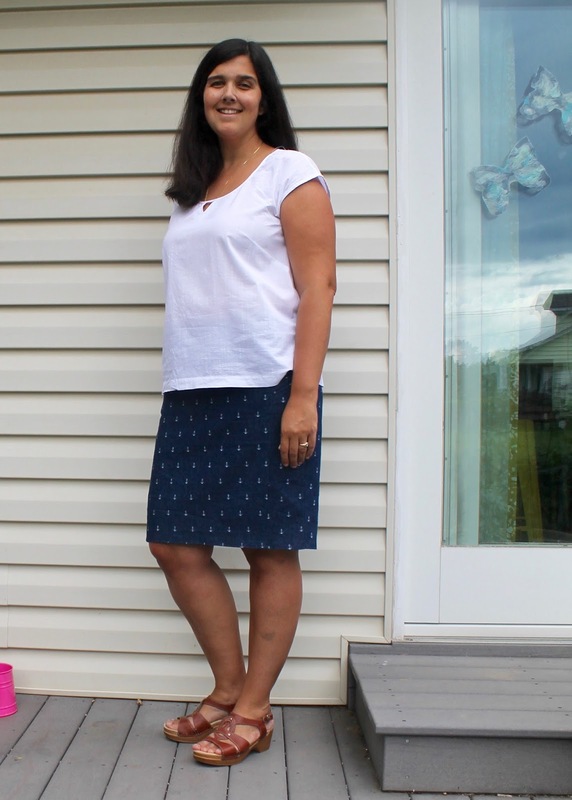 I like it a lot with the anchor-print pleated pocket skirt I made a couple months ago. And I am so happy with the fit. It is just right through the shoulders and bust - with no gaping neckline, no pulling in the chest - and enough ease in the tummy and hips to be comfortable but enough shaping to avoid looking tent-like. I'm really, really happy with the results of the work I put into adjusting this pattern. 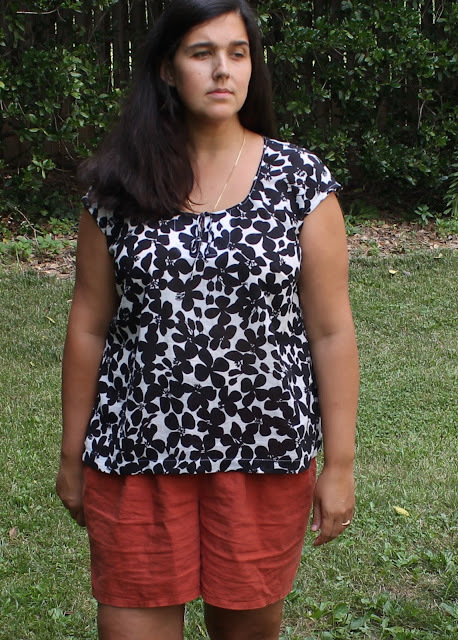 After I made the white blouse, I cut another out of the last of a cut of double-faced gauze that I previously used to make a dress for Z. I did this one with a shirt-tail-shaped hem and faced the neckline and sleeves with bias made from the same brown linen from my Simplicity 1887 shorts. I was overzealous in lowering the neckline, though, so I ended up having to put in a modesty panel. I also messed up while cutting the back, so I had to cut it in two pieces and seam it. I will be honest, although this top is very comfy and goes well with three of the Simplicity 1887s in my closet, I don't love how it looks. 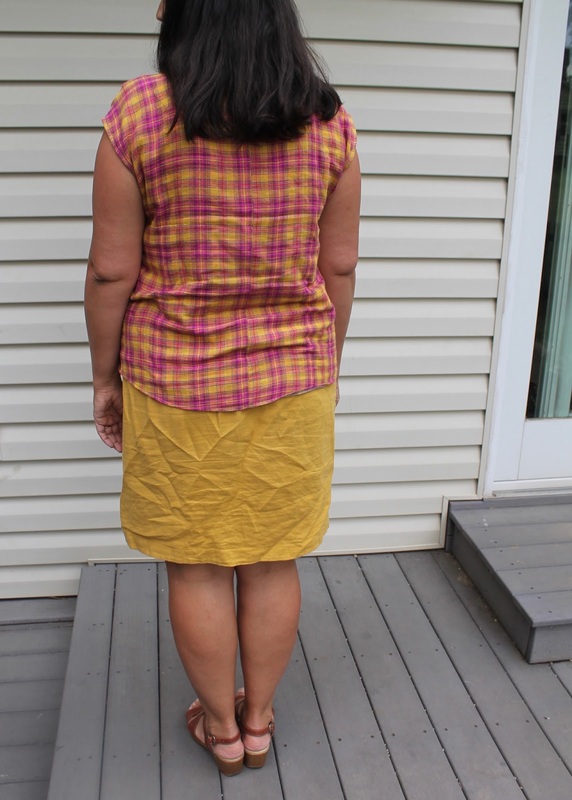 I'm really annoyed with myself about the low neckline - I don't like how the modesty panel breaks up the plaid, but the gauze is shifty enough that I wasn't even going to try to match the pattern. I sewed the darts properly and tied them off instead of backstitching. I also pressed well over the edge of my ironing board. But they are still pointy - I feel like the fabric is to blame here. And I don't really like the shape of the neckline. I wasn't even going to post photos of it, but since I do wear it fairly regularly, my blogger conscience compelled me to include them. 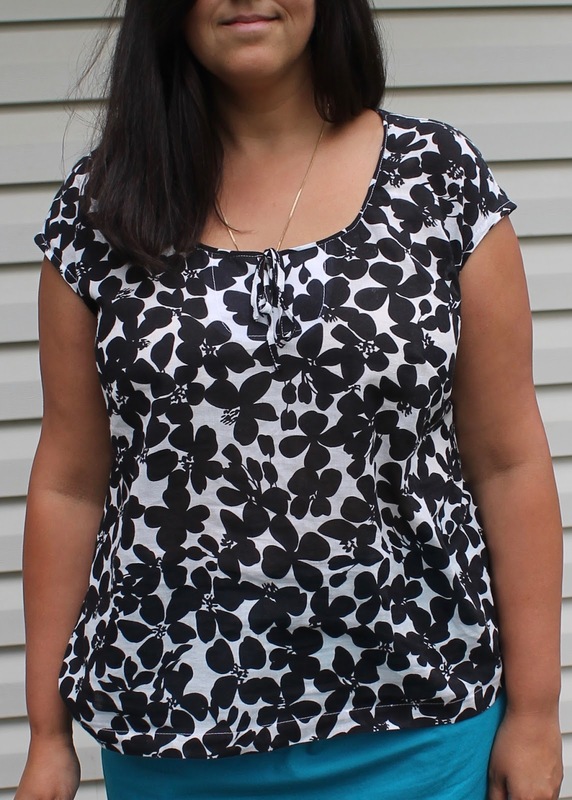 Far more happily, I sewed up a third blouse in this J. Crew crepe cotton voile that I bought two years ago for $3 a yard from (where else) Fabric Mart. I used a facing to create a slit neckline that is tied with the ends of the 1/4" binding that also finishes the neckline. I also widened the hem a smidge, adding 1/2" at the hem and tapering to nothing at the narrowest point of the top. I French-seamed the shoulders and side seams again. I.love.this.blouse. LOVE. Something about the way the fabric drapes almost makes it feel like it was bias-cut. I love the tie detail and I love the print. I wish I had it in five more colors (and am kicking past me for not buying it in the other colorways FM had at the time). I did, however, have a heck of a time getting halfway-decent photos of this top. My most successful shoot took place just after a steamy rainstorm, and my camera lens fogged right up. But these photos show the shape of the top the best, so try not to squint too hard. I'm not finished playing with this pattern. Following all my adjustments, I'm really happy with the way the pattern fits, and the silhouette is simple enough that I can see hacking it many different ways. One that I would like to try soon is a bloused-top, elastic-waist dress similar to the Bettine or the Olivia. Yes, I could just buy one of those patterns, but since I already have this top altered for my shape, all I need to do is draft the skirt part and I'm set. This is my "I'm going to melt because it's 200% humidity out here" face. These are SO flattering on you, Masha! You look amazing! And I'm a bit shocked to hear that you don't like the plaid version. 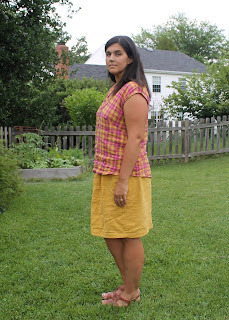 I saw it in your other post about the shorts and was imediately taken by what I saw as a "yoke" cut on the bias. I wasn't sure if it was storebought, but regardless, I was like, that top is THE BOMB. I love it! The "modesty panel" is what makes it for me. I totally get that it wasn't what you were planning to make I think you should reconsider. It truly makes an interesting design feature. You are killing it with this pattern. Your adjustments really have made this a perfect fit on you. Well done. These look amazing on you! I love the white one and I actually like the contrast in the plaid one. I think my back is smaller than my front and after actually getting fitted for a bra I should probably look into an FBA. What they said. I am trying to get to the place you are with this particular pattern. Wouldn't you know. It is not available anymore. I have another in mind. 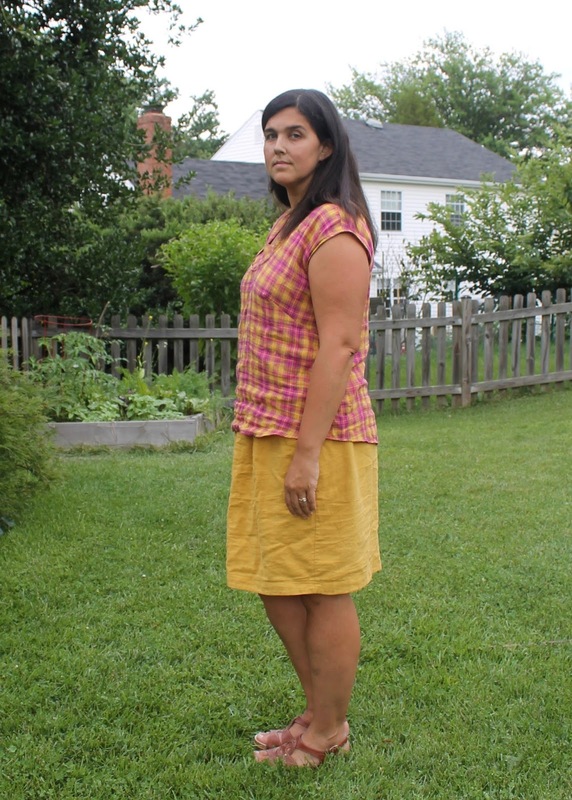 I am going to do as you did and just keep making a pattern and adjusting it until it fits like yours do. I love the white and the black and white. Keep up the good work inspiring us. I actually tracked my copy down on eBay (I only bought it a couple of months back)! 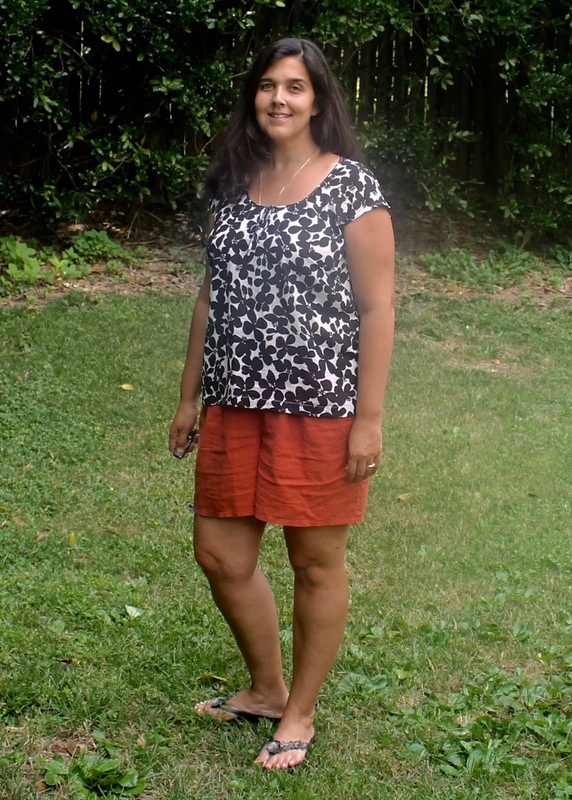 Surprising how hard it is to find a simple woven kimono tee pattern! Good luck in your quest! I really like the plaid. The bias modesty panel really works, but I know it's frustrating not getting the result you're hoping for. The black and white floral is smashing though! 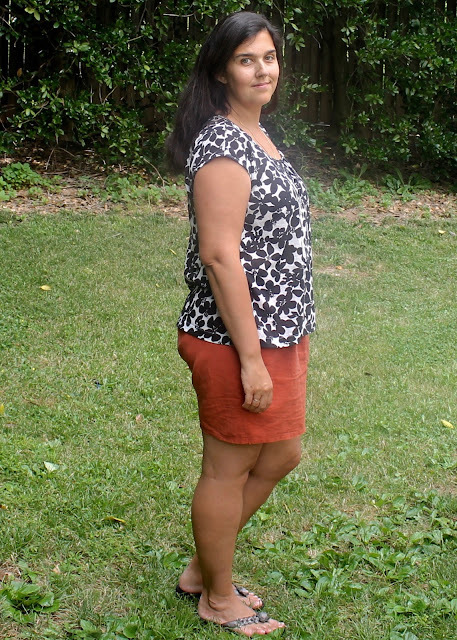 These colors look great on you, and the print is very modern and fun. Beautiful work!